Robert Pirsig’s recent passing has led a lot of people to reflect on Zen and the Art of Motorcycle Maintenance, which he published in 1974. He acknowledges in his author’s note that the book has nothing to do with “orthodox Zen Buddhism,” but the rest of the book makes it clear that he’s not interested in orthodox Zen Buddhism in the first place. Instead, Pirsig understands Zen as direct, unmediated experience that cannot be expressed in language. In this sense, his book is about Zen, but it’s the kind of Zen that isn’t tied to a particular culture, history, or religion. For Pirsig, Zen is the romantic counterpart to the rational, logic-driven mindset that he initially favors. Eventually, he concludes that one must embrace and balance the rational and the romantic to achieve Quality, a philosophical ideal in which one finds fulfillment. Zen isn’t the only religion or philosophy Pirsig draws from in developing his idea of Quality, though; Greek philosophy, Hinduism, and the thought of people like Henry David Thoreau also play important roles, even to the point of overshadowing Pirsig’s use of Zen. Yet the connection between Zen and this book remains outsized due to its title and its influence on popular conceptions of Zen in the U.S.
Pirsig didn’t invent the idea that Zen is fundamentally about direct experience, or “being in the moment.” As the UC Berkeley Buddhist Studies scholar Robert Sharf points out in two articles (one on Zen and Japanese nationalism, the other on the idea of experience in Buddhism), D.T. Suzuki popularized this notion, drawing on Romanticism as well as the Kyoto School philosophy of Nishida Kitarō. Suzuki’s version of Zen inspired Eugen Herrigel, the Nazi who wrote Zen in der Kunst des Bogenschiessens, or Zen in the Art of Archery in 1948. Herrigel presented Zen as a kind of practiced effortlessness that underlay archery as well as various other Japanese arts. These ideas, as well as Herrigel’s title, clearly inspired Pirsig’s Zen and the Art of Motorcycle Maintenance (though there were several other Zen in the Art of… titles that came out just before Pirsig’s title, such as Ray Bradbury’s Zen in the Art of Writing in 1973). Zen and the Art of Motorcycle Maintenance marked a shift to “Zen and the Art of…” titles, replacing the previous “Zen in the Art of…” titles. Ironically, Pirsig’s philosophy suggests that his title should have been “Zen in the Art of…” which would have underscored the importance of direct experience in motorcycle maintenance, a skill that to Pirsig symbolized of the rational approach to life. Regardless, Pirsig’s title paved the way for a slew of Zen and the Art of… books, from Zen and the Art of Making a Living to my personal favorite, Zen and the Art of Cooking Beer-Can Chicken. These titles may seem superficial and incidental, but they have significantly shaped perceptions of Zen in American popular culture. Not only is Zen inextricably tied to art (however one may define it), it can also be associated with absolutely anything. These titles remove any historical or cultural specificity from Zen Buddhism to make Zen a transcultural, ephemeral experience. This ties in very closely to how Pirsig presents Zen in the body of the book as well. At the same time, Zen and the Art of Motorcycle Maintenance has sparked its many readers’ interest in Zen, Buddhism in general, and comparative religions. The book’s creative structure, which combined road trip memoir, autobiography, and philosophical treatise, echoes its eclectic contents. While it may not cohere as much as a traditional narrative, it provokes deeper reflection and challenges readers to make their own meaning from Pirsig’s journeys. I think this is why the book has left a mark on so many people, and even steered some into the academic study of religion. I was honored to discuss Robert Pirsig’s Zen and the Art of Motorcycle Maintenance earlier this week on PRI’s The World. I hope it’s of interest! These “drop and give me Zen” products coalesce around wellness, the recent buzzword that encompasses physical, mental, and spiritual health. Most shirts with this slogan are marketed as workout gear, and of course the slogan itself plays off the familiar phrase “drop and give me ten,” which is usually associated with drill sergeants, coaches, and sadistic gym teachers. By changing “ten” to “Zen,” the slogan replaces push-ups or sit-ups with something vaguely spiritual and detached, but still focused. The common conflation of Zen and yoga reflects this vagueness about where these practices come from and what they involve. They’re both seen as Eastern in a nonspecific way that encompasses calmness, intentional breathing, and spirituality. The view that athletes adopt Zen-like concentration while competing also informs the slogan’s connection of Zen with athleticism. As with other Zen products, this shirt constitutes the ever-increasing inflation of Zen in American pop culture. Whereas Zen once had stronger ties to minimalist aesthetics and cosmopolitan sophistication (though still as a commodity), it is becoming a brand accessible to more and more Americans. Stewart-era Moments of Zen were similar, and often depicted political figures and celebrities doing and saying ridiculous things. This montage of moments from March, 2013 includes Megyn Kelly’s befuddlement with the word “sequester,” Joe Biden repeating “Buy a shotgun!” and the actress Piper Perabo responding to fitness guru Richard Simmons’s hijinks on Access Hollywood. The Daily Show‘s Moment of Zen thus began as an ironic, basic cable twist on an old network standby: with all of Zen’s connotations of calm, nature, and contemplation, a “Moment of Zen” should look like a “Moment in Nature,” right? Yet this is not just a simple snarky inversion. The Daily Show‘s Moments of Zen also appeal to an image of Zen that many of its viewers would probably know. Our old friend D.T. Suzuki was very influential in presenting Zen as a kind of pure experience that transcended logic and rationality. He found support for this image in kōans and legends about Zen masters’ behavior in which they utter apparent non sequiturs and do things like cut cats in two. 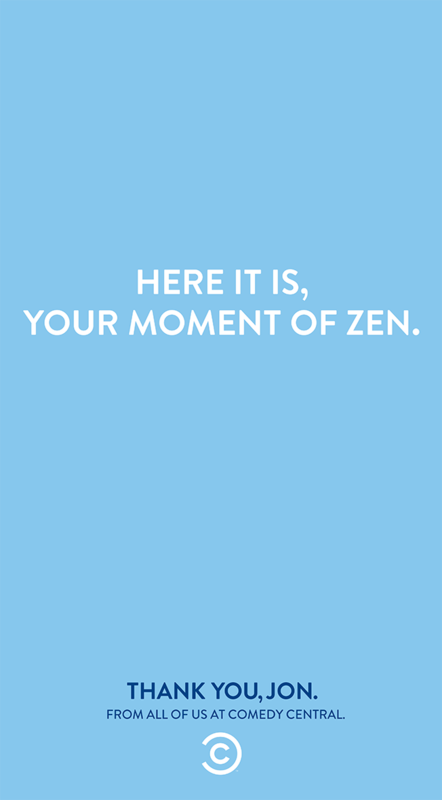 Along these lines, the “Moment of Zen” is Zen because it doesn’t make sense, thereby turning a pundit’s in(s)ane ramblings into the inscrutable speech of a true Zen master, and vice versa. At the same time, Jon Stewart’s Daily Show often used its “Moments of Zen” to critique the vapidity of political discourse, celebrity culture, and 24-hour news channels. We could read Moments of Zen as ironically highlighting the gulf between a “real” Zen master and, say, Donald Trump. Like other such uses of Zen, The Daily Show‘s “Moments of Zen” inflate the term: if anything can be a Moment of Zen, Zen loses its religious and historical specificity. Even if most people who knew about this segment didn’t consciously link it to Zen Buddhism, the “Moment of Zen” still draws on viewers’ existing associations with Zen and forges new ones. In this case, the meanings Zen takes on might be more politically engaged than with most Zen commodities. From Steve Jobs’s Zen connections, to Wisdom 2.0 conferences, to mindfulness classes on tech campuses, Buddhism has strong roots in Silicon Valley. Zen’s aura of modern minimalism, calm focus, and social consciousness makes it a popular brand for fledgling companies, as Patrick Clark observed in the 2013 piece “Zen and the Art of Startup Naming” for BloombergBusiness. Clark lists a total of ten startups with Zen in their name, including ZenPayroll, Zendesk, Zenefits, Zenfolio, etc. In considering why so many tech companies have gone with Zen names, Clark cites a 2008 article by the corporate copywriter Nancy Friedman on religious rhetoric in business in which she claims, “zen is often a synonym for ordinary nothingness.” While people do use Zen to signify nothingness or emptiness, I think the proliferation of Zen startups points to additional facets of Zen’s commodification. ZenPayroll is on a long-term mission to modernize the payroll industry and connect companies with their employees in a more meaningful way. Today people think of payroll as a painful, tedious chore that forces businesses to deal with unnecessary complexity, manual tasks and numerous fees. Compensation should not be an impersonal transaction. It’s about employers rewarding people for their hard work, and employees feeling appreciated for their contributions. Our team is striving to positively influence millions of businesses and hundreds of millions of employees around the world. That mission is a key reason customers love ZenPayroll. This positivity extends to features such as ZenPayroll Giving, which allows employees to automatically deduct charitable contributions from their paychecks. 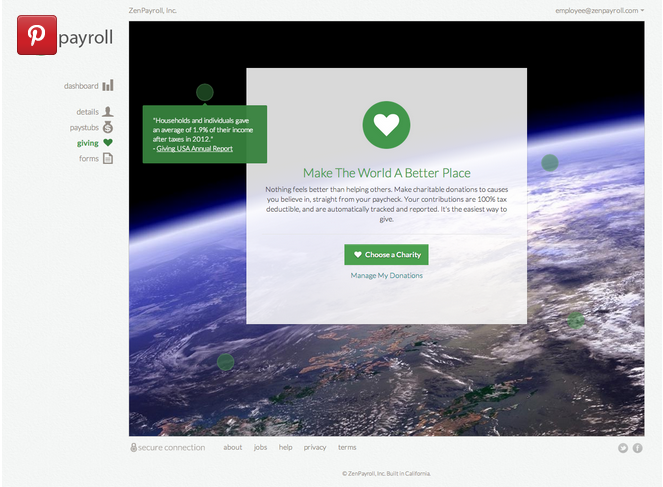 The ZenPayroll Giving screen that users see features the slogan “Make the World a Better Place,” a sentiment that has become such a cliché in the tech industry that it has been repeatedly parodied on the HBO series “Silicon Valley.” There’s nothing wrong with wanting to make the world a better place, but it comes across as disingenuous (as well as generic and vague) in a neoliberal economic system that rewards self-interest over the common good and relegates social welfare to the private sector. Considering that much of Silicon Valley’s interest in Buddhism (specifically in the forms of meditation and mindfulness) stems from the desire to work more efficiently and succeed in the industry, calls to improve the world ring hollow. ZenPayroll’s positive, charitable attitude ties into Zen’s associations with calmness and peace: Zen masters aren’t supposed to get angry or exploit others, though history — that eternal buzzkill — offers plenty of counter-examples. Joshua Reeves, CEO of ZenPayroll, explained the company’s name in Kristen Brown’s 2014 article for the SF Gate, “Startups Fighting over the Word ‘Zen'”: “the company was looking for a name that communicated the company’s goals of making payroll a simple, ‘peaceful’ process for small businesses, rather than the headache it more often is.” Brown’s article included ZenPayroll as one of the dozens of Zen-branded companies that have become targets of Zendesk’s lawsuits. Zendesk, founded in 2007, has tried to aggressively protect its brand against upstart startups by alleging that people could easily confuse similarly named companies. (This doesn’t just happen in the tech industry: HBI International sued Rocky Patel Premium Cigars in 2011 over Zen branded tobacco and related products.) However, this has only worked against companies that lacked the resources to fight legal battles. On one hand, it is easy to see Zen’s transformation into a trademark or brand as a separate phenomenon from its other roles as religious tradition or spiritual practice. Reading books about Zen, participating in Zen devotional practices, or engaging in Zen meditation can happen without awareness of Silicon Valley’s many Zen companies. Yet I do not believe Zen-as-brand exists in isolation from other understandings of Zen. Using Zen in company names changes its meanings in a way that fits into larger cultural shifts. The “spiritual marketplace” in which people compare and consume different religious options, including Zen, belongs to the same system that makes Zen an appealing name for tech startups. Zen companies are not just trading on whatever cachet the term “Zen” has left after all this inflation (Zenflation? ), they are changing what Zen signifies. Will people be less interested in Zen Buddhism after Zen becomes known more as a company name, brand, or desktop kitsch than as a religious tradition? “The only people who get anyplace interesting are the people who get lost.” — Henry David Thoreau. Thoreau was interested in Buddhism and translated the Lotus Sūtra into English for the first time, but even more than that his attitude toward Buddhism and Hinduism set the stage for popular understandings of these traditions in the U.S. (thanks to Jeff Wilson for the correction — it was Elizabeth Palmer Peabody who translated the Lotus Sūtra into English) He did not convert to Buddhism, but explored Buddhism alongside Christianity, Greek religion, and Hinduism, seeking the deeper truths of existence he saw as underlying each. 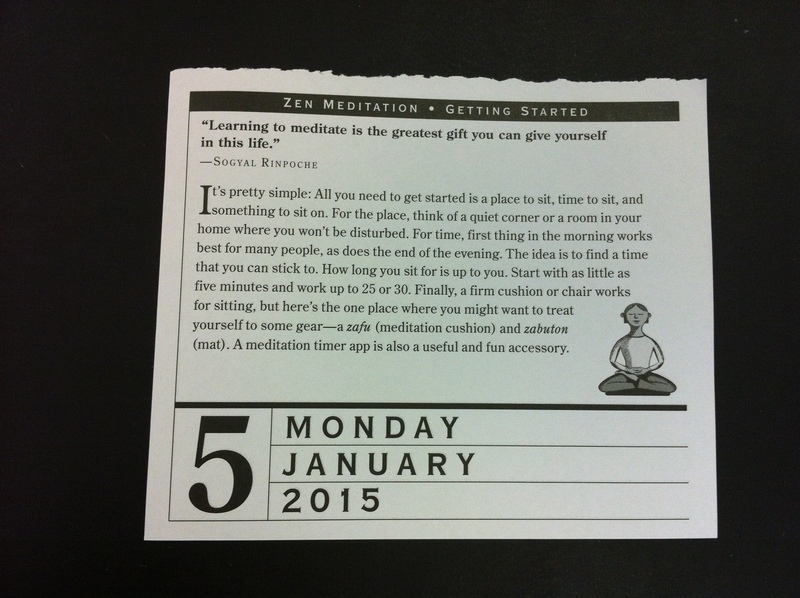 This approach has spread in the centuries since, as evidenced by the Zen calendar’s broad definition of Zen. While Thoreau had a connection to Buddhism (if not Zen specifically), there are plenty of figures quoted in the calendar who didn’t. Take, for example, Mark Twain (Tuesday, July 28: “A thing long expected takes the form of the unexpected when at last it comes”), Pablo Neruda (Wednesday, May 20: “When did the honeysuckle first sense its own perfume? When did smoke learn how to fly?”), and the generic “Spanish proverb (Tuesday, January 6: “It is not the same thing to talk of bulls as to be in the bullring”). 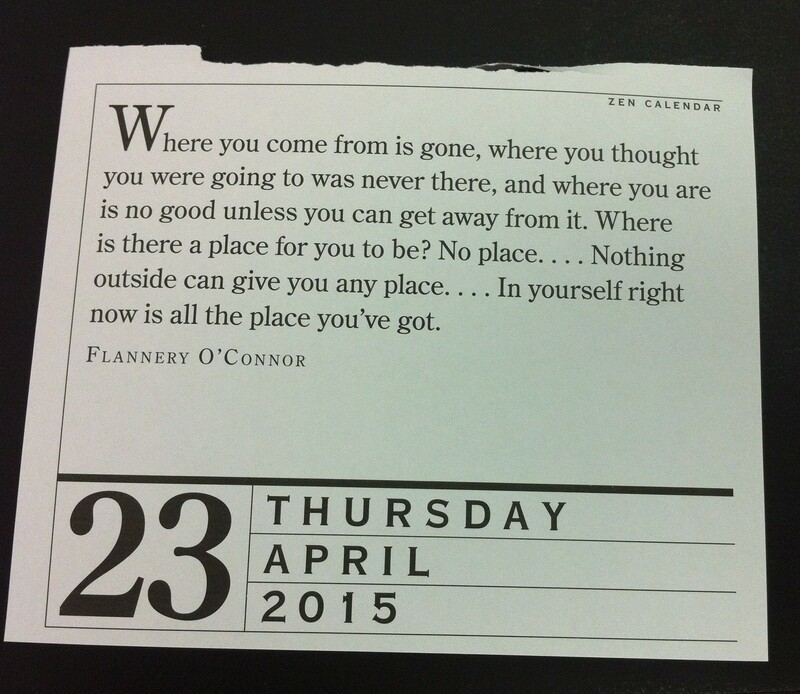 The calendar quotes from many Buddhist figures, such as Ruth Denison, Chogyam Trungpa Rinpoche, and the Dalai Lama, and does include several Zen masters, as well, among them Mazu, Dōgen, and Hakuin. However, to be considered Zen a quotation just has to be pithy and vaguely mystical, evoking the literary genres of the kōan and haiku. This understanding of Zen goes back to the image developed by people like D.T. Suzuki: if everything is Zen, anything is Zen. D.T. Suzuki’s influence is also apparent in the introduction and mini meditation primer that presents a basic form of meditation over the week of January 5-9. The introduction proclaims that Zen is about meditation and direct experience (hence the Proust quotation), which could come straight from Suzuki’s writings about the timeless essence of Zen. As with other aspects of modern Buddhism, these notions aren’t necessarily wrong or inauthentic from an academic perspective, but they are recent, which is to say that the idea of timelessness is not itself timeless. The primer prescribes meditation focused on the breath, which isn’t unique to Zen (or Buddhism), but is part of Zen meditation practice. The author shows some familiarity with Japanese Zen in referring to zafu and zabuton cushions, and in alluding to the concept that seated meditation is enlightenment. On the last page, the author even encourages readers to seek out a sangha, or Buddhist community, for group practice. Considering the usual emphasis on solitary practice in the home or office in Zen products, I found this suggestion surprising. 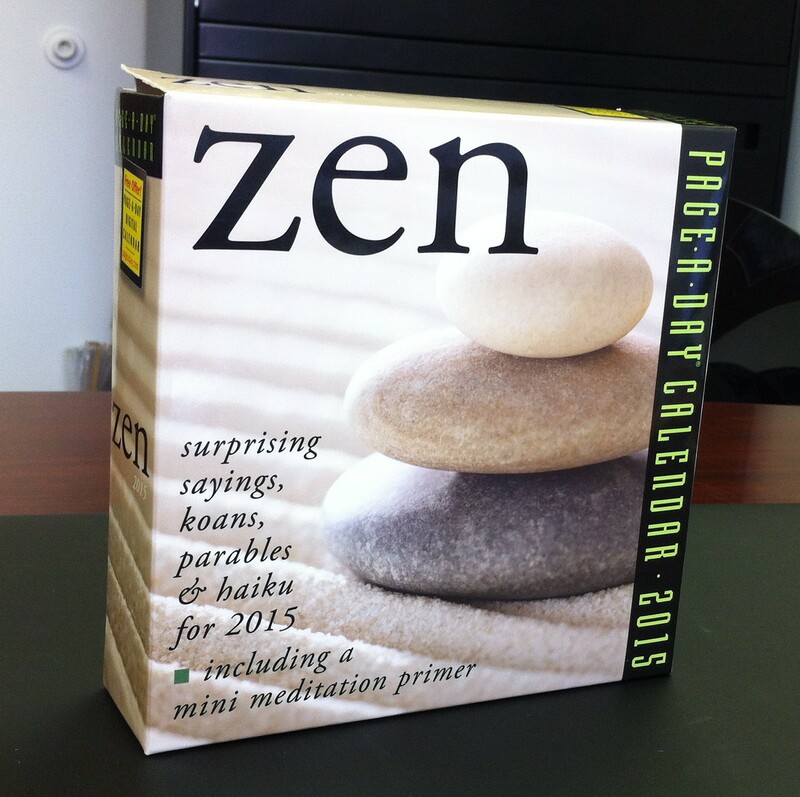 As a whole, however, this calendar falls into the category of made-in-China desktop Zen products meant to provide calm and contemplation during a hectic workday. 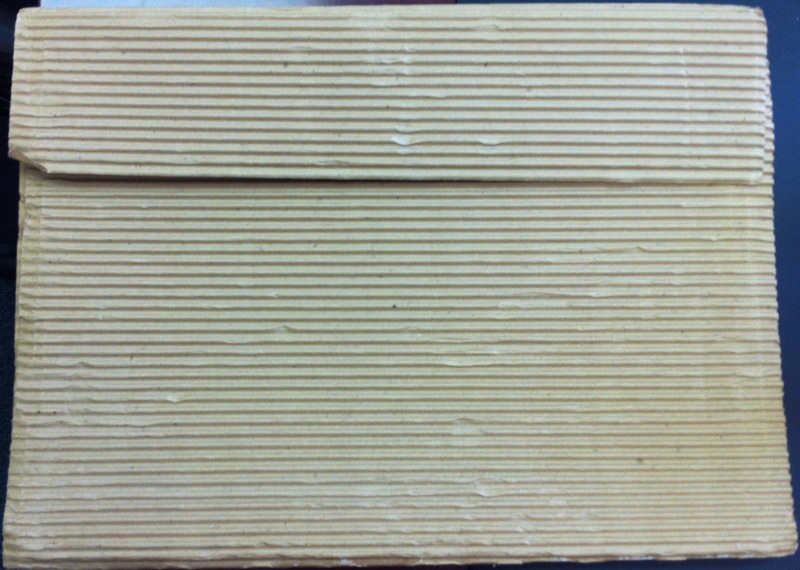 Among the many Zen products in my office, the Zen Board is one of the most unassuming, tucked away in its corrugated cardboard envelope on top of a filing cabinet. 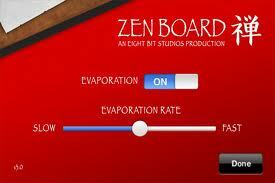 This minimalist simplicity is part of the marketing appeal of the Zen Board (also called the Buddha Board). People can use water to paint whatever they want onto the plain white backdrop, then watch it fade away. 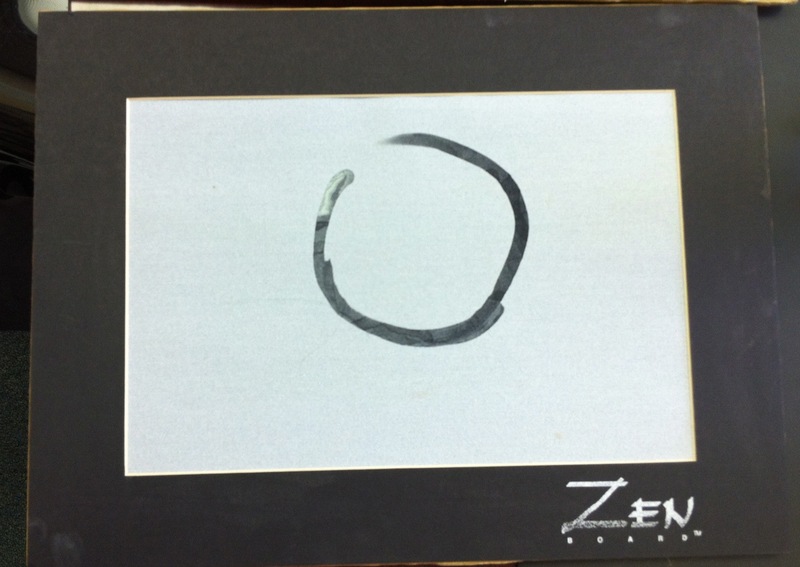 It’s especially well suited to the kind of ink painting and calligraphy that has become associated with Zen, which is the key connection to the “Zen” label. The Zen Board draws on the aestheticization of Zen that we can also see in rock gardens and the ubiquitous “Zen and/in the Art of…” genre. This understanding of Zen aesthetics does not incorporate the gilded opulence of many Chan/Zen/Sŏn monasteries, but is limited to black and white ink paintings and calligraphy, as well as the stark minimalism of rock gardens at places like Ryōanji. In the contemporary U.S., Zen minimalism still signifies aesthetic sophistication for many, though the rampant commodification of Zen might be diluting the brand. These products, like most other Zen marketing, are presented as a respite from the daily grind. They promise at least a brief window of living in the moment, a breath of simplicity amidst the chaos of the workday. As such, they depend on this kind of hectic lifestyle (and capitalism in general) to justify their existence. Many product reviews on Amazon described the product as therapeutic, which also relates to the common associations between Zen and self-help. Products like the Zen Board reinforce the idea that Zen is an experience that anyone can have — at least, anyone with $35.00 to spend (or 99 cents for the app). As a native Eugenian and graduate of the University of Oregon, I find myself conflicted this weekend, as the Ducks are taking on the University of Tennessee Volunteers. I teach at UT, so I’ve been feeling ambivalent about the outcome of the game. I’ve decided to work through this by comparing the Zen dimensions of UT and UO football. Zen and football may seem like an unlikely pair, but each school has its own version of this apparent paradox. 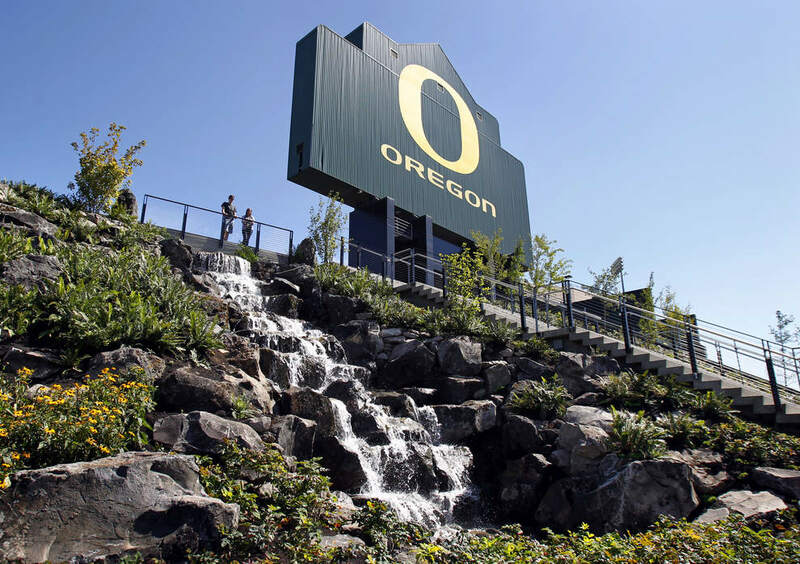 A few weeks ago Eugene’s Register-Guard published the story “A New Aut-Zen” about recent renovations made at Autzen Stadium, home of the Ducks. These renovations, which cost about $5 million, created a new area at the stadium called “Zen North,” which boasts (among other things) two waterfalls that are the tallest and fastest manmade waterfalls in North America. Zen North also features hundreds of trees, thousands of other plants, and various structures made of salvaged wood. The project aims to ease the flow of fans entering and leaving the stadium, and enhance the fans’ experience at Autzen. The “Zen” of Zen North plays off the idea of a minimalist, sophisticated Zen aesthetic, and also seems to refer to the new natural features and their intended calming effect. But do football teams really want their fans to be calm? I’m not aware of any plans to add Zen features to Tennessee’s Neyland Stadium, but a former UT player has received the “Zen” label in recent months. 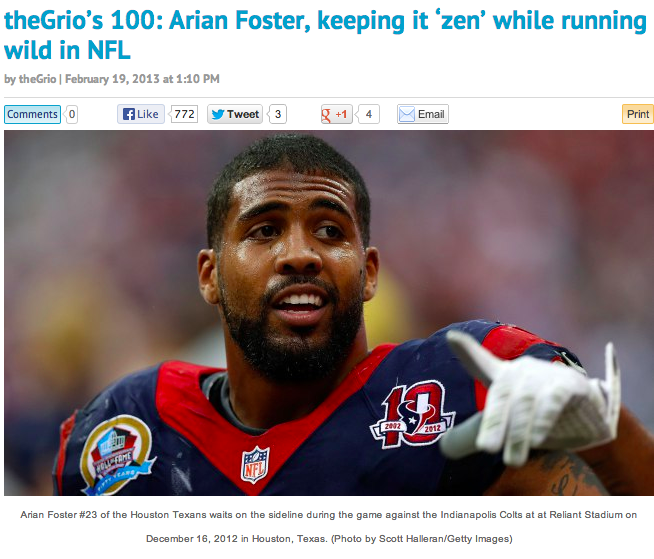 Website theGrio.com describes Arian Foster as “keeping it ‘zen’” in the NFL, and Foster has received other media attention for his veganism and practice of bowing in the end zone. Foster majored in philosophy at UT (before my time) and the ESPN story on his bowing quotes him as saying, “I studied Buddhism for a while. […] I’m really into different types of cultures and religions. I really like their belief system, and I just believe we’re kind of all in this together as people, energies and life forces.” He explains the bowing as the Hindu namaste gesture, in which the divine in oneself recognizes the divine in others. Though I don’t know if he would identify himself as “Zen,” he clearly has some familiarity with Buddhism and Hinduism, and his veganism puts him in line with the diet of Zen monks. Oregon might have the edge going into the football matchup, but Arian Foster gives Tennessee the win in the Zen contest: multi-million dollar renovations (Zen-ovations?) don’t compare to Foster’s actual knowledge of Buddhism. Judging these two teams in a Zen contest might not seem very Zen, but then again neither does football. Perhaps the paradox of “Zen football” can be its own koan: may the most Zen team win.